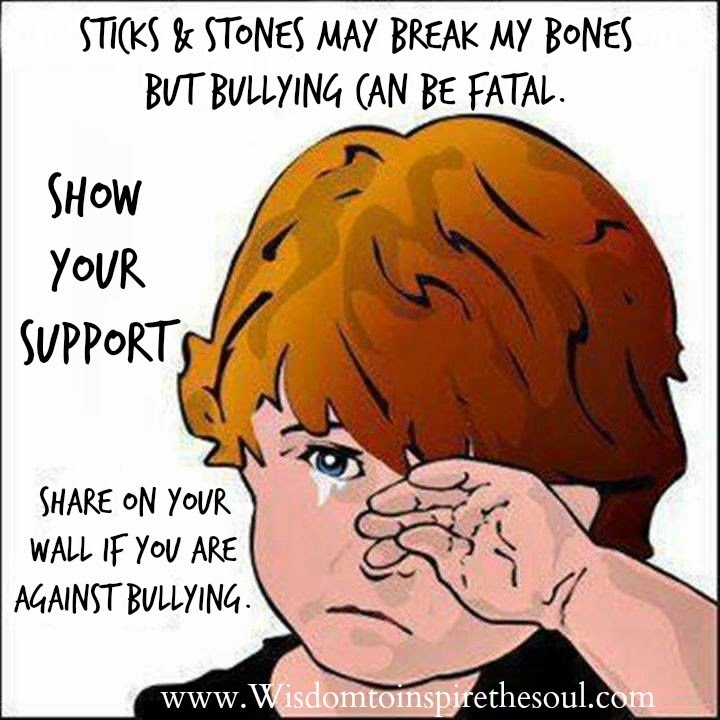 Daveswordsofwisdom.com: Bullying - The myths and facts. There are many myths surrounding bullying issues and some of these myths can often trivialise bullying and suggest the bullied individual is making a big deal out of nothing when actually that is not the case. This can undermine how a person feels if they are being bullied. Bullying should not be tolerated in any form. We believe it is important to address bullying whether it is in a workplace, school or in the community so that the message is clear that bullying is unacceptable. The myths and facts below can be a great discussion point to raise awareness of bullying with children and young people. Myth: Bullying is a normal part of childhood and you should just ignore it. Fact: Bullying is not "normal" or acceptable in any form and ignoring might not always make it stop. If you can, please confide in someone you trust such as a parent or teacher to help you get it stopped. Bullying can knock your self-esteem and confidence. Fact: It’s understandable that you may be angry but if you were to get violent or aggressive it may make matters much worse as you may get into trouble too. Fact: Bullies often adopt this behaviour from their environment or sometimes, it’s a reaction from them being bullied by others. Whatever the case, it is not right. Fact: This is not the case at all, bullying can happen to anyone at any place. It may be out of school, at university or even college. It can happen when you are out with mates or on the way to or from school. Fact: There is no such thing as a way a bully looks or acts. There is no specific dress code or behaviour code. Fact: People being bullied online is a very serious issue, the bullying can go viral very quickly and make the problem escalate quickly. It is important to take a screenshot of any conversations, messages or posts that you feel are bullying so that you have a record. Myth: Cyberbullying doesn't involve physical harm so what's the harm? Fact: Actually, some people have committed suicide as a result of not seeing any way out of the non-stop harassment, threats and abuses. The emotional scarring stays for a lot longer and sometimes a person will never get over this. Some websites allow people to post anonymously which can mean it is very hard to stop this abuse. Fact: This is not true, we often hear of pages and fake accounts being created without person’s permission or knowledge. This sort of cyberbullying is on the increase and just as serious as any other form of bullying. Fact: Regardless of hitting delete, once something is posted online is gets its own unique URL which means that it can stay on cyberspace even if you hit delete. Myth: If bullying was so bad, why don't they have a law about it? Fact: Some forms of bullying are illegal and should be reported to the police including violence or assault, theft, repeated harassment or intimidation, e.g. Threats and abusive phone calls, emails or text messages and hate crimes. Fact: You may worry that reporting a bully might make the bullying escalate or they feel they are not believed. It is important to confide in someone you trust so that you can have some help in getting the necessary support to get this stopped. Fact: It is not always easy to identify the signs of bullying as it is not always physical and obvious. Emotional, verbal and online bullying can often leave scars that people don’t see. Fact: Quite often children who bully may grow up to be adults who bully or use negative behaviour to get what they want, unless there has been intervention and their behaviour challenged by the relevant authorities, whether it be school or parents, etc. Trump is filthyest bully in America yet millions of ignorant americans condone his bullying on a daily basis?where have American values gone and why?Trump's new normal far from normal?